A change of pace tonight with some swatches, rather than nail art. 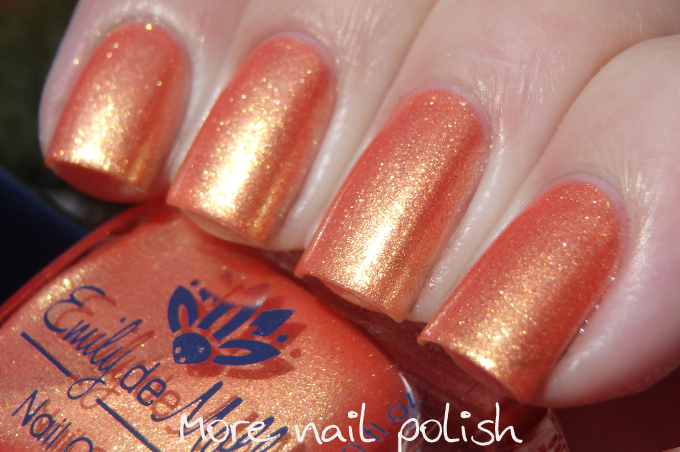 My blog used to be all swatches looking back over the years, but I just wasn't able to sustain it! 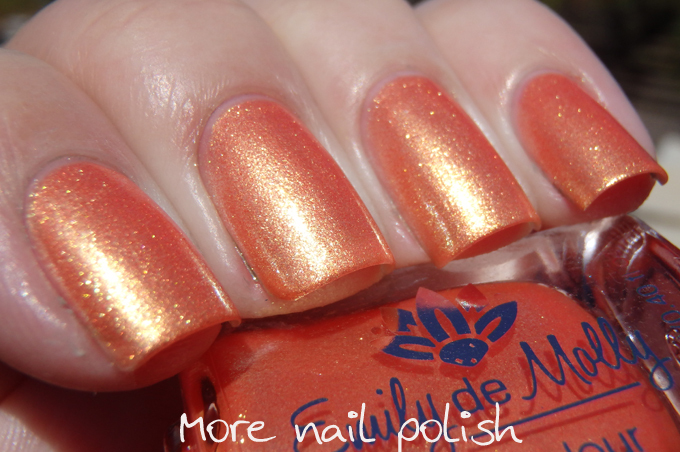 But there are a few select brands that I still love to share swatches of, and Emily de Molly is one of those. Tonight I have polishes from the December 2015 release, I know I did the October release, but I have no idea what happened to the November release. I'm sure I have the polishes in my EdM drawer of my helmer, and I know one of them was Crystal Crown that I wore as a Christmas mani, but it looks like I never actually posted the November polishes. My bad! Anyway, I have four of the five polishes. I didn't get the pink polish from the collection, because I'm just not that into pink polish very often. But lets take a look a the four I did get. Empty Journal - Ooooohhh me likey! Check out that glow. 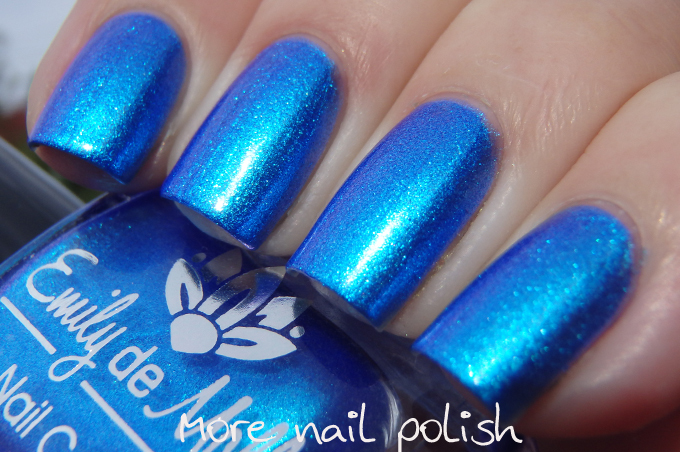 This one is an electric blue foil with a great formula that was opaque at two coats. These photos were taken in natural diffused sunlight. Major Themes - in the same style as Empty Journal, this is a pastel orange foil that is created with a strong gold shimmer. This looks so magical in real life and again is so glowy. Show Down - A purple leaning pink in some lights and a pink leaning purple in others. This little chameleon has gold to green shifting shimmer and iridescent flakes, plus a soft sprinkling of silver holo glitter. This is three coats on it's own, and there is a slight visible nail line. This one can easily be layered over darker shades for a complexly different look. Understatement - yeah, so this polishes name is the complete opposite for what it is. 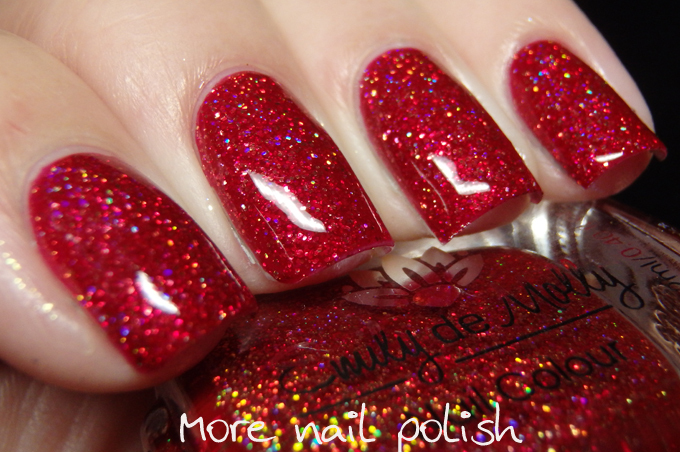 If you want an understated polish then this is not it! 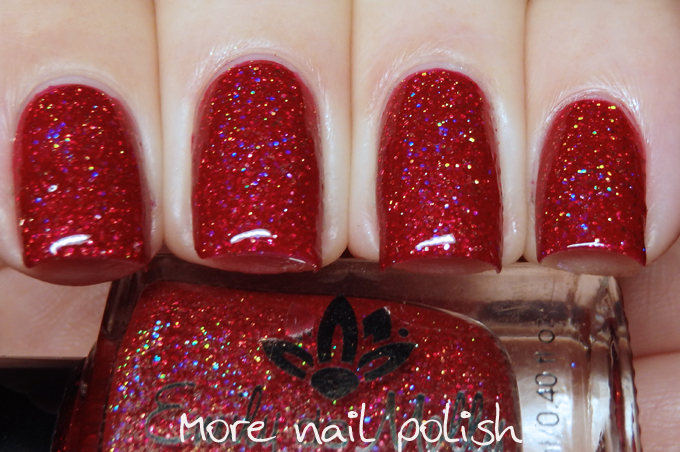 Red glitter polishes are the bane of my blogging photography life. I can never, EVER, make them look even half as awesome as they do in real life. 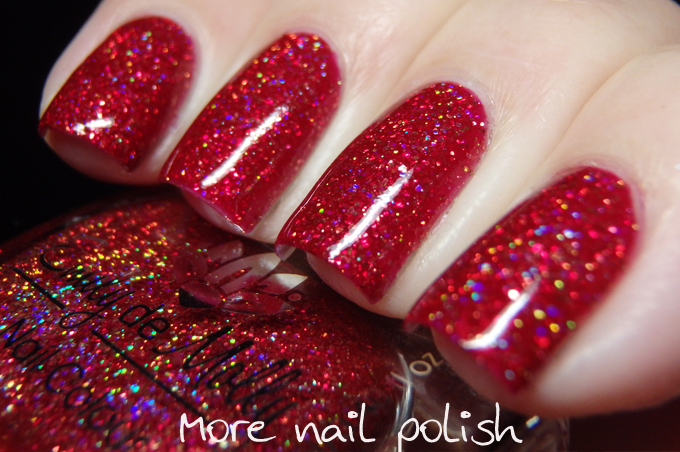 Understatement is a dark red jelly with gold ultra holo glitters and it is incredible. This is two coats with Seche Vite top coat. 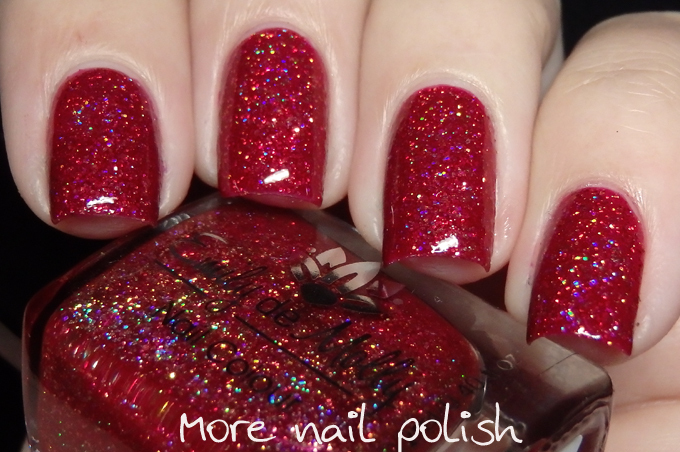 The December collection is available from the Emily de Molly Australian site. There are a number of stockists worldwide as well as the EdM USA warehouse.